At the end of the day, Tyrese Maxey just wants to play with his friends. After his showing in Indianapolis, we think that's best as well. After a strong first session in Dallas with Drive Nation, Maxey decided to make a move. He was blessed with a terrific situation at Drive Nation, but Maxey felt like something was missing. That 'something' was the assistance of his long-time partners-in-crime; De'Vion Harmon, Chris Harris, Bryce Okpoh and De'Aaron Tucker - all playing for the Houston Hoops. So Maxey made a move. Houston in his final grassroots destination. "Don't get me wrong, Drive Nation is talented, is one of the best teams I've ever played on," Maxey said. "They're really good, but it just wasn't like family. I want to go out with a bang with my brothers." 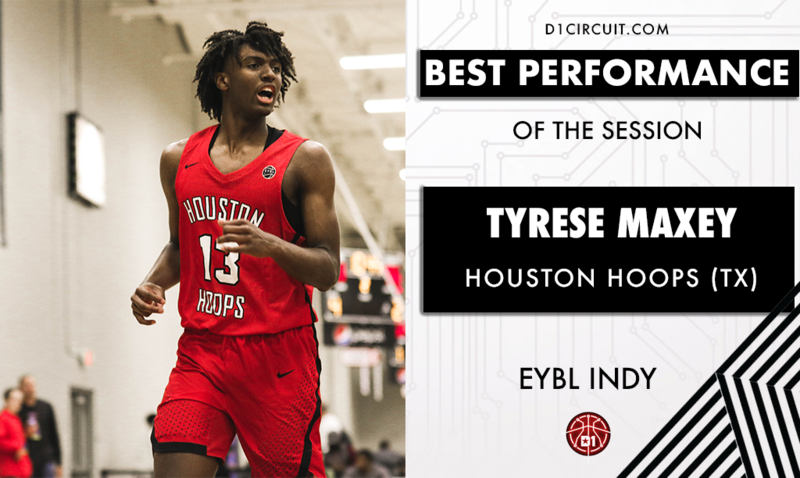 Maxey wasted no time in his debut EYBL session for the Hoops. Reunited with his former teammates, Maxey and company didn't skip a beat. The Hoops went 4-0 in Indianapolis, including a buzzer-beater from Maxey in a win over the Phamily. But Maxey's best work came last. In Sunday's session two finale against a loaded Athlete's of Tomorrow (GA) squad, Maxey went off for 39 points, four rebounds and four steals, lifting the Hoops to an 83-79 overtime victory. Maxey shot 14-for-25 from the floor, nailing five three-pointers while going 6-for-7 from the line. He was a menace in transition and played composed, only turning the ball over once in 35 minutes of action. Perhaps the most impressive aspect of his performance, is that it came against such a strong opponent - AOT is 6-2 and ranked in the top ten. Maxey was relentless on offense, a trait that helps separate himself from the rest of the 2019 class. Check out Maxey's highlights below, which also included a killer game from AOT sophomore Sharife Cooper. We also caught up with Maxey below, who raved about how excited he is to be back with his teammates. 39 POINTS (15-27 FG), 4 REBOUNDS, 4 STEALS in a win over AOT.